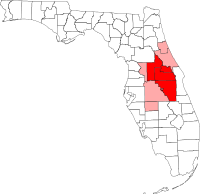 The University of Central Florida (UCF) is an American public research university in Orlando, Florida. It is the largest university in the United States by undergraduate enrollment, and the second largest by total enrollment. Founded in 1963, UCF opened to provide personnel to support the U.S. space program at the Kennedy Space Center and Cape Canaveral Air Force Station on Florida's Space Coast. As its academic scope broadened, it was renamed from Florida Technological University to the University of Central Florida in 1978. While initial enrollment was only 1,948 students, enrollment today amounts to some 60,821 students from 140 countries and all 50 states and Washington, D.C. 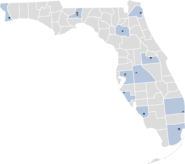 The majority of the student population is located on the university's main campus just 13 miles (21 km) east-northeast of downtown Orlando, and 55 miles (89 km) southwest of Daytona Beach. The university offers over 200 degrees through thirteen colleges and twelve satellite campuses in Central Florida. Since its founding, UCF has awarded almost 280,000 degrees, including 50,000 graduate and professional degrees, to over 240,000 alumni worldwide. UCF is a space-grant university, and has made significant research contributions to engineering, optics, simulation, digital media, business administration, education, hospitality management, and the arts. Its official colors are black and gold, and the university logo is a Pegasus, which "symbolizes the university's vision of limitless possibilities." The university's intercollegiate sports teams, commonly known as the "UCF Knights" and represented by mascot Knightro, compete in National Collegiate Athletic Association (NCAA) Division I and the American Athletic Conference. Following President John F. Kennedy's September 1962 speech, in which he described his goal of accomplishing a manned space flight to the moon by the end of the decade, the space program grew in importance and scope in Central Florida because of its proximity to Cape Canaveral. Prominent residents and local leaders began lobbying the Florida State Legislature to increase access to higher education on the Space Coast. With the help of former State Senate President William A. Shands and Senator Beth Johnson, the legislature passed and Governor Farris Bryant signed into law Senate Bill No. 125 on June 10, 1963, which authorized the Florida Board of Regents to create a new state university in East Central Florida. The university was founded as a non-segregated and coeducational university, with the mission of educating students for promising space-age careers in engineering and other technological professions. What are the academic rankings for University of Central Florida? 1. number 103 for Academics. 2. number 141 for ROI (Return on Investment). 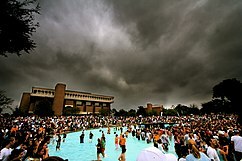 What universities are similar to University of Central Florida?